Stop topical cholinesterase inhibitors (e.g. phospholine iodide) 2-3 weeks before surgery in order to reduce the chances of hyphema and postoperative uveitis. Topical epinephrine products should be stopped 3 days before surgery. Miotics break down the blood-aqueous barrier and should be stopped 2 weeks preoperatively. Steroids: Topical steroids can be started prior to surgery (1-3 weeks before op: Barneby) (2-7 days preop: Pearls of glaucoma management). Oral steroids in appropriate doses can be started in patients with high risk of failure due to inflammation e.g. uveitic-glaucoma. o Inadvertent injury to extra-ocular muscles and anterior ciliary vessels may occur. o Excessive conjunctival manipulation can produce button-holes, thin blebs and lead to scarring. o There can be difficulty in locating posterior sources of bleeding. 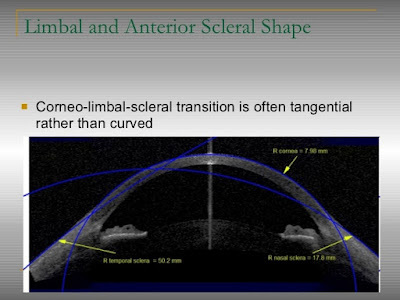 o Be aware of the abrupt change in the curvature of the globe at the limbus to avoid premature entry into the anterior chamber (AC). 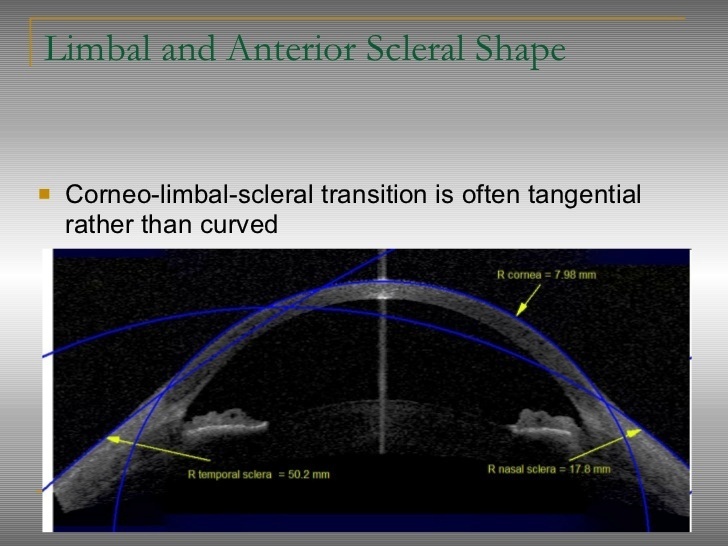 o It is important to maintain a uniform scleral flap thickness. o If the lateral edges of the scleral flap are ‘feathered”, excessive aqueous may leak through poorly apposed wound edges postoperatively. o A very thin scleral flap can result in dehiscence, maceration or avulsion during manipulation and suturing. The torn scleral flap can be sutured with 10-0 or 11-0 nylon sutures on a non-cutting needle. A plug of Tenon’s capsule can be sutured to close a scleral buttonhole. If required, a donor scleral or autologous (dura mater or pericardium) graft can be used to close a buttonhole or a new flap needs to be constructed after closing the defect. o These can be avoided by limiting dissection with sharp instruments. If a large buttonhole is created early during the procedure, choose a different site for surgery. o A 10-0 or 11-0 nylon/polyglactin suture on a non-cutting vascular needle can be used to close the conjunctiva in a shoestring or mattress fashion. Tenon’s capsule can be incorporated into the defect. If the buttonhole is near the limbus the conjunctiva with the hole can be excised, the cornea abraded lightly with a blade and the conjunctiva sutured to the area by 10-0 nylon mattress sutures. A buttonhole noted near the end of the surgery can be closed by an autologous conjunctiva graft from the inferior conjunctiva. Amniotic membrane transplantation is also possible. o Episcleral bleeding is common, especially those on long-term antiglaucoma medications. Some suggest stopping the topical treatment and putting the patient on Oral Acetazolamide a few days prior to surgery. Damage to the ciliary body can also cause brisk bleeding. Cautery may not work, but intraocular bipolar units on a low setting may be effective. Alternatively, sustained, gentle pressure with a sponge on the fistula or an air bubble in the AC may be attempted. Choroidal/expulsive hemorrhage can result from sudden decompression causing rupture of a choroidal vessel. An immediate inferior temporal scleral incision is practiced by some. o It can occur in patients with prominent episcleral vessels, e.g. Sturge-Weber Syndrome. It is characterized by sudden shallowing of AC or rotation of ciliary processes through the iridectomy into the sclerostomy. It is managed by making a scleral incision to release suprachoroidal pressure. o Vitreous loss during creation of fistula or iridectomy, due to rupture of lens zonules and hyaloid membrane due to excessive manipulation. It can be managed by vitrectomy (manual or automated). Lens injury and stripping of Descemet’s membrane may occur. o Releasable scleral flap sutures can be applied to prevent sudden lowering of IOP (hypotony) in the postoperative period. The sutures can be removed 1-14 days after surgery. 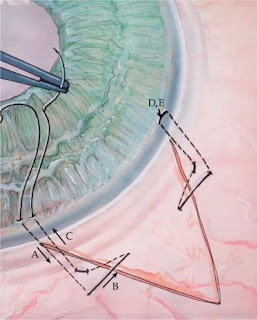 o Passage of a needle during suturing can cause intraoperative laceration or disinsertion (amputation) of the scleral flap. 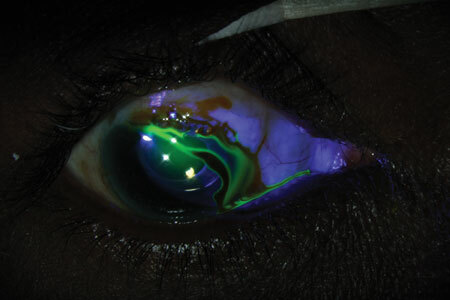 Injury to the lens, corneal endothelium or intra-ocular hemorrhage can occur if the needle is misdirected. Scleral flap disinsertion can be avoided by making the flap of atleast 1/3rd scleral thickness. Avoid exposed suture ends or knots as they cause ocular irritation and act as a wick leading to blebitis or endophthalmitis. o Scleral flap sutures can also be lysed postoperatively by Argon laser. A topical anesthetic and phenylephrine to constrict the conjunctival vessels can be applied. A Hoskins, Zeiss or Ritch lens can be used. The laser settings are: 50µ spot size, 0.1 second duration and power between 200-600 mW. It may occasionally be difficult to identify the suture due to overlying fibrosis, edema or hemorrhage. Excessive manipulation of the contact lens during laser suturelysis can cause conjunctival damage and buttonholes. o Small intra-operative hyphemas usually resolve within 24-48 hours and rarely require surgical intervention (AC washouts). o Postoperative uveitis is a common occurrence. Corticosteroids and possibly cycloplegic agents should be given to avoid formation of posterior synechiae and occlusion of sclerostomy site. o High IOP with a shallow or flat bleb and deep AC in the early postoperative period suggests internal blockage of the sclerostomy or tight scleral flap sutures. Immediate gonioscopy should be done (using a lens with a diameter smaller than cornea, e.g. Zeiss). The sclerostomy can be blocked by: incompletely excised Descemet’s membrane, iris, ciliary processes, ciliary body, lens, lens capsule, fibrin, and vitreous or coagulated blood. Retained viscoelastic, when used to form the AC, may also temporarily raise the IOP. Blood and fibrin clots may also cause occlusion of the sclerostomy but usually resolve with time and ocular massage. Tissue plasminogen activator (TPA) can be used (5-10µ) for intracameral injection to help early lysis of the clot. Entrapped tissue (iris, ciliary processes, lens capsule) can be disrupted with argon or Nd:YAG laser. o If the internal ostium is found to be free of obstruction, flap manipulation is required. This can be done by digital massage or pressure to the edge of the scleral flap by a cotton tipped applicator (cotton-bud). The scleral flap sutures should not be removed for the first 2-3 days to avoid over-filtration, hypotony, maculopathy or choroidal detachment among others. 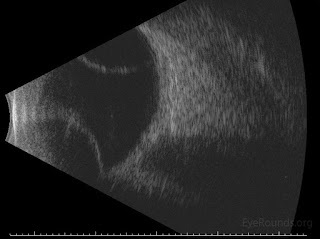 o Causes are: over-filtration, wound leak, aqueous hyposecretion (temporary ciliary shutdown can occur due to over-cautery) and/or choroidal effusion. Low IOP with shallow AC is common in early postoperative period. The AC is shallowest on day 2-3 and gradually deepens over the next 2 weeks. Requires conservative measures such as bed rest, cycloplegia, pressure patch, Simmons shell/symblepharon ring/oversized contact lens placement. A prolonged (1-2 weeks) Grade 3 AC requires surgical intervention to prevent corneal endothelial cell loss and decompensation, cataract, anterior/posterior synechiae and bleb failure. Viscoelastic injection into the AC can be done as a temporary measure to wait for the spontaneous resolution of the condition. · Aqueous hyposecretion= Causes are: Iridocyclitis, ciliary body detachment, cyclodialysis cleft, postoperative use of topical aqueous suppressants in the operated eye, systemic carbonic anhydarse inhibitors, excessive use of postoperative topical phenylephrine, ciliary body exhaustion from an excessively large sclerostomy or leaking conjunctival wound. This leads to a shallow or flat bleb. o A low IOP is common in the first week or two after surgery. o It is characterized by an exuberant bleb. Such a bleb can be avoided by releasable sutures. The condition is initially managed by external tamponade (torpedo bandage). Gentamycin eyedrops may help by producing some amount of scarring. Solcoceryl gel may also help. Prolonged overfiltration may require surgically tightening of the scleral flap. o Common in the early postoperative period and characterized by a positive Seidel’s test. Non-invasive treatments include: pressure patch, topical antibiotic, aqueous suppressants, Simmon shell or large contact lens. Definitive therapy is surgical closure. o Can cause a persistently low IOP and flat AC. This may resolve within 1-2 weeks spontaneously. A persistent flat AC or choroidal hemorrhage requires surgical management. The AC is entered through the old/new paracentesis. An AC maintainer is preferably inserted. Fluid is drained from the inferior temporal quadrant. If the suprachoroidal fluid is excessive, a scleral incision in the same quadrant is required. If eye remains soft or AC doesn’t form, a conjunctival buttonhole should be looked for. The scleral flap should also be tightened by additional sutures. The scleral incision is not sutured and only the overlying conjunctiva is closed with a running absorbable suture. Ø Pupillary block is rare in presence of a patent peripheral iridectomy. o There is posterior pooling of aqueous within or behind the vitreous. It causes forward movement of the lens-iris or hyaloid-iris diaphragm. The AC is very shallow uniformly or flat. 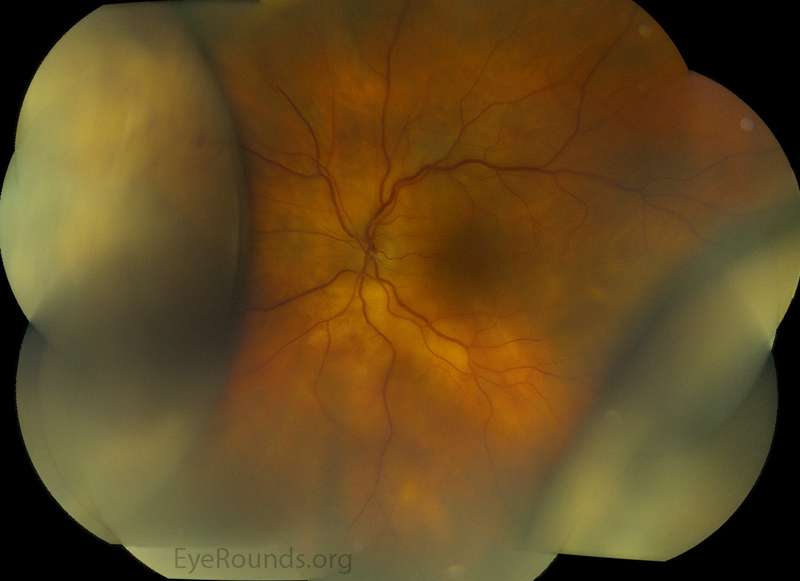 IOP is usually high, unless there is a choroidal detachment and/or functioning filtration bleb. 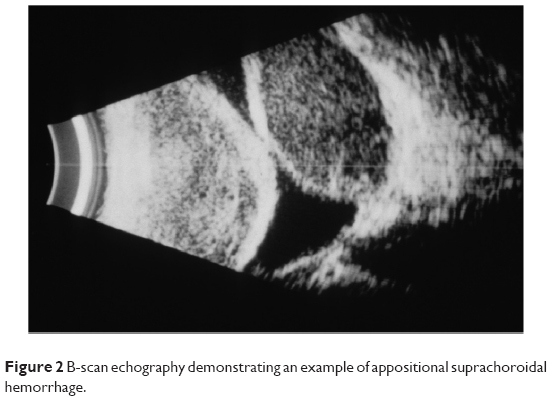 Ultrasound biomicroscopy can show fluid in suprachoroidal space. 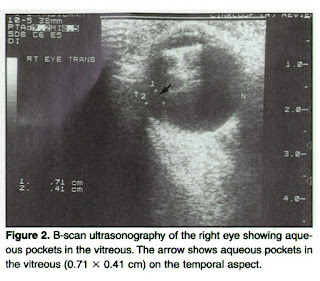 B-scan will show fluid-filled pockets in vitreous. Risk factors for MG include: Patients with chronic angle closure glaucoma, peripheral anterior synechiae and uncontrolled glaucoma. It may occur immediately following surgery or after cycloplegic agents are discontinued. If MG occurs in one eye, there is a high risk of the condition developing in the other eye. o Management of MG= Initial management is with topical Atropine 1% (or Scopolamine 0.25%) every 6 hours, topical 2.5% phenylephrine every 6 hours, topical and/or systemic aqueous suppressants and systemic hyperosmotic agents. Nearly 50% of the cases resolve with medical treatment. However, the patients may require cycloplegic therapy for the remainder of their lives. o If AC doesn’t form in 3-5 days, further treatment is required. Argon treatment of visible ciliary processes, Nd:YAG anterior hyaloidectomy or posterior capsulotomy in aphakic/pseudophakic eyes is performed. In case above measures fail, then surgical intervention in the form of vitrectomy with rupture of anterior hyaloid face in apahkic/psuedophakic eyes combined with lensectomy in phakic eyes is sufficient. Ø Suprachoroidal hemorrhage= It can occur intraoperatively or in the first few postoperative days. It is characterized by: pain, a firm eye, shallow AC and a dark mass visible in the pupil. It is commoner in: old patients with systemic vascular disease and eyes with advanced glaucoma, high pre-operative IOP, aphakia/pseudophakia and eyes which have undergone previous surgical procedures including vitrectomy. Reduction of IOP and control of hypertension prior to surgery may prevent the occurrence of a suprachoroidal hemorrhage. o Early postoperative sudden loss of vision may occur in advanced glaucoma (“snuff-out” or “wipe-out” syndrome). o Patients with extensive glaucomatous damage, a remaining small (≤5 degrees) central island of vision or VF splitting fixation are most susceptible. This wipe out occurs with medical therapy also with equal frequency, so surgical treatment is not a contraindication for surgery. o Other causes of visual deterioration include: cystoid macula edema, hyptonic maculopathy, choroidal folds, retinal vascular occlusion and anterior ischemic neuropathy. o Sudden lowering of IOP leads to decompression retinopathy consisting of intraretinal, subretinal and occasional suprachoroidal hemorrhages. Dot and blot hemorrhages mimicking CRVO are present in mid-periphery. Prognosis for visual recovery is usually good. Early postoperative non-rhegmatogenous serous retinal detachment can occur in hypotonous eyes with choroidal detachment. This resolves with normalization of IOP. Persistent surface-wrinkling maculopathy and tears in the retinal pigment epithelium have been reported. o Early POE is very rare (o.1%).